Busy, busy, busy. I just got back from my whirlwind weekend at Disneyland last night and I was so exhausted. Going to the parks for a couple of days is amazing, but totally exhausting since you are running around the park all day trying to hit all your favorite rides and eateries. This type of all day exercise calls for a comfy all day outfit. The weather in Anaheim was a bit temperamental being freezing (freezing for me is anything under 60 degrees) in the morning and at night and being really warm during the day. This meant I had to strategically choose an outfit that contained a couple of layers. I went for a pair of super comfy black leggings from Forever21 and I got them for under $4! Seriously, I had to buy them in at least four other colors. They are the perfect basics to throw on. Walking around the park all day, you need to opt for a comfy pair of shoes and I am never comfier than in my favorite pair of black converse. Walking around the park, I always feel like I need at least one piece of Disney attire and I have the perfect sweatshirt for that. 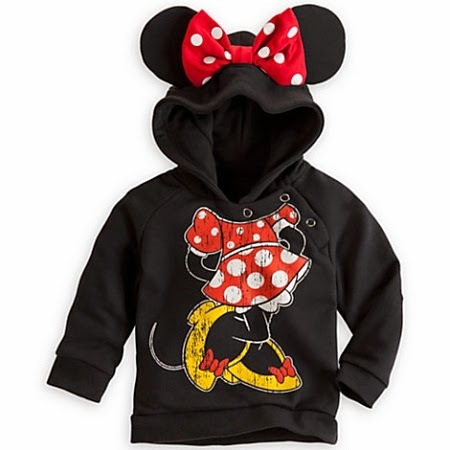 My Minnie sweatshirt has a cute hood with Minnie Mouse ears and her signature bow. My boyfriend got it for me the last time we hit Disneyland since it got so cold at night and I love to wear it whenever I’m having an off day. It gives me a little dose of the disney magic at the Disney parks and at home. Sadly, you can only really find these at the Disneyland Resort parks, but if you happen to stop by, this is the best sweatshirt to pick up! I needed a shirt that would keep me warm, but could also be converted to handle the midday sun. 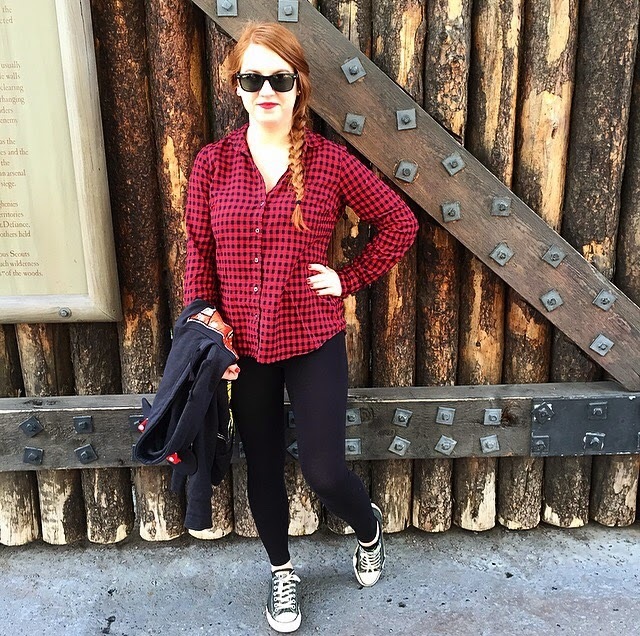 I love these J.Crew flannel shirts and picked a festive red and black one to wear while we wandered around Disneyland. It was great to keep me cosy, but the sleeves can easily be rolled up if it got hot. I also went for a really low maintenance hairstyle while walking around the parks. You never want to be the one having to restyle her hair after every ride so I opted for a cute little side braid with all my whispy hair pieces and bangs pinned to the side. Perfect for all the topsy turvy rides with their sudden stops and drops. 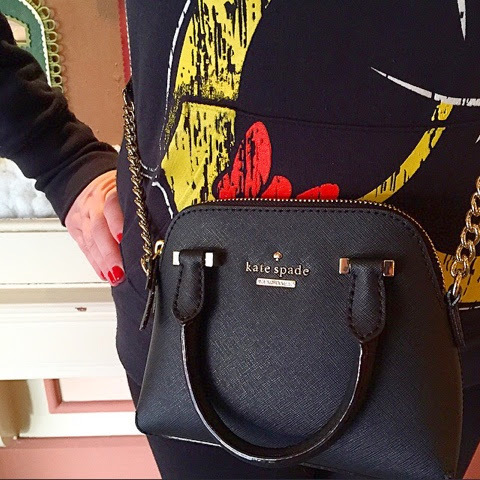 The last absolutely essential piece of my Disneyland outfit was my Kate Spade Mini Maise in black. I picked up this little purse at a Kate Spade holiday event last week and I found that it was the perfect cross body mini bag for my weekend trip. It was great to put all my airplane essentials so I didn’t need to pull out my huge purse every time I needed to grab chapstick, headphones or my wallet. It’s the perfect size for carrying those absolutely must have items and I can totally see myself using it for every upcoming holiday party! That's a cute outfit! Love the purse. I hate huge purses, but that purse is the perfect size. Got to love F21! Glad to hear you had fun! Not only looking comfy but also super trendy! Love it! What a great bag! I love that it has two handle options. My friend had that exact Kate Spade purse last year-ish. I loved it on her, and I love it on you! Such a cute outfit! When we were in Disney World last week, I saw those sweatshirts EVERYWHERE and thought they were adorable. I tried to buy one for my toddler, but neither the baby nor the toddler ones fit her well. Since she couldn't get one, I didn't either–so much for being that cutesy matching family! 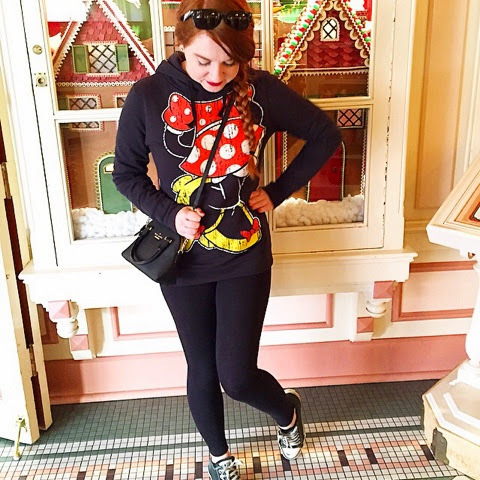 Great outfit for Disney and a super cute sweater. That is super cute! I got a mickey sweater that I wear all the time..
Can't do lots of walking without my Converse, love them! Your outfit is so cute and perfect for a fun Disney day! So cute, I love that flannel! That Kate Spade pocketbook is definitely on my birthday list. Glad you had fun! That hoodie is amazing!!! Can't wait to take our littles to Disney!